“Don't make me angry. 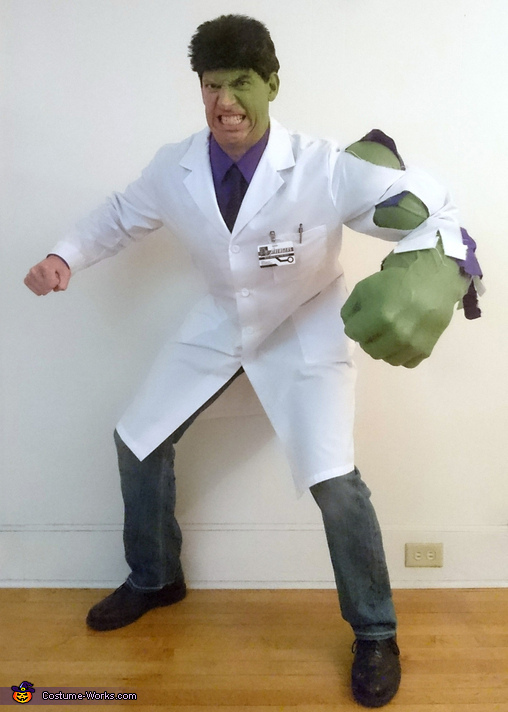 You wouldn't like me when I'm angry.” I decided I wanted to be Bruce Banner transforming into the Incredible Hulk for Halloween. I found some vintage foam “Hulk Hands” on eBay and extended the left hand's forearm by gluing it to the right, end-to-end, then cut off the right hand at the wrist. This created a full forearm that tapered back towards the elbow while wearing. I used a tube of silicone sealant to fill the seams and add some veins. Acrylic paints were added to make it a more realistic “Hulk” green. I bought an Incredible Hulk padded muscle costume, cut the left arm off the jumpsuit and stuffed the arm muscles sections with the stuffing from the remaining jumpsuit to bulk the arm up. I coated the fabric muscles with a few layers of liquid latex to appear skin-like, added some veins with the tube sealant, then painted with the same paints to match the hand-forearm. I purchased a purple dress shirt and white lab coat, then strategically ripped both left sleeves to fit and expose the arm muscles and forearm-hand. The arm was then stitched underneath the dress shirt at the shoulder seam to hold it in place. I added some green face paint diagonally across my face, ear and neck, along with one light-green colored contact lens and a “Hulk Wig” to give the appearance of partial transformation into the Jade Giant. A tie, name tag, pair of jeans and dress shoes completed the look of the MARVEL-ous scientist, Dr. Bruce Banner.